After Saturday’s effort, he was bound to sleep well. Conley’s runner at the buzzer gave Memphis a 71-69 halftime lead. 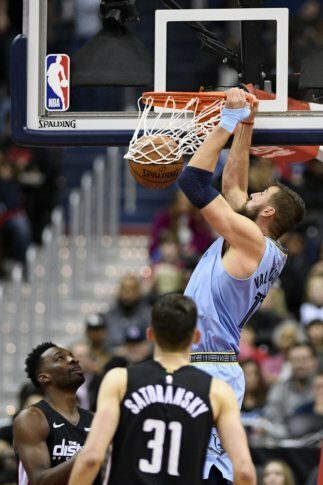 Grizzlies: It was the first time in franchise history the Grizzlies and their opponent each scored at least 100 points through the first three quarters. … It was Conley’s 10th double-double. … F Chandler Parsons had season highs in points (16) and rebounds (six). Wizards: G Tomas Satoransky was in the lineup after leaving Friday’s game for a concussion evaluation. … Are 9-4 in the second of back-to-backs. … The Wizards have won five straight against the Grizzlies at home. Parker picked up his second straight double-double and seventh of the season. He was asked if this is some of the best offensive basketball he’s played in the NBA. “I played good basketball throughout the first couple of seasons in Milwaukee and right now it brings good memories back,” Parker said. “They did an X-ray and the X-ray came back negative, but he just had some pain in his foot so I’m not sure yet what it is,” Bickerstaff said.